WATANABE Yoshimi, the president of Your Party, the first of the Third Force reform parties, gave an interview published in the press last week. Here it is in English. What is your strategy for victory in the lower house election? WY: The key to victory is whether we can segregate the candidates of the so-called Third Forces and avoid going head-to-head against each other in election districts. An inability to do that will create the worst result, which would be crushing each other. You’re competing with the Japan Restoration Party in some districts. WY: We took our time to select good people and meet our target of 70 candidates. In those places where we couldn’t reach a compromise, we have no choice but to go head to head. You weren’t able to merge with the Japan Restoration Party. WY: We reached a broad agreement with the party in policy discussions, but the gulf between us is too wide to allow a merger. As soon as they merged with (Ishihara Shintaro’s) Sun Party, the opposition to nuclear power disappeared. Civil service reform is the A of the ABCs for both Your Party and the Japan Restoration Party, but this has also disappeared. Won’t the people wonder what happened and view this suspiciously? What are the points at issue in the lower house election? WY: We intend to fight on the policies of growth without a consumption tax increase, small government, and regional devolution as opposed to centralization. Governance by the bureaucracy in Japan has resulted in a deflationary economy. The political class is no longer the control tower of governance. National strategy has been left entirely to the vertically divided central government bureaucracies. We will restore the Japanese economy by creating a real control tower and implementing a competitive growth strategy. You’re calling for a suspension of the consumption tax increase and converting the tax to a revenue source for local government. WY: Allowing an increase in the national government tax will facilitate bureaucratic governance. The dependency on central government will become chronic. That’s why we want to make that tax a local government revenue source. The starting point for this debate is a new state/province system with regional autonomy. How will you achieve “zero nuclear energy”? WY: Nuclear energy is the extension of the electric power supply system based on regional monopolies. If each of the utilities can achieve mutual adaptability, we can secure enough energy at peak periods without nuclear energy. We will promote the deregulation of power generation and the separation of the generation and supply systems through the entry of new companies into the industry. More consumers will choose their power sources. That way, nuclear power will gradually fall away. What will the framework of government be after the election? WY: That all depends on the outcome. If the Liberal Democratic Party and New Komeito become the largest bloc, they will probably have to create a coalition with the Democratic Party to supplement their own forces and create a stable government. That’s because gridlock would still exist in the upper house. It is very likely that the system of three-party collusion will be maintained. 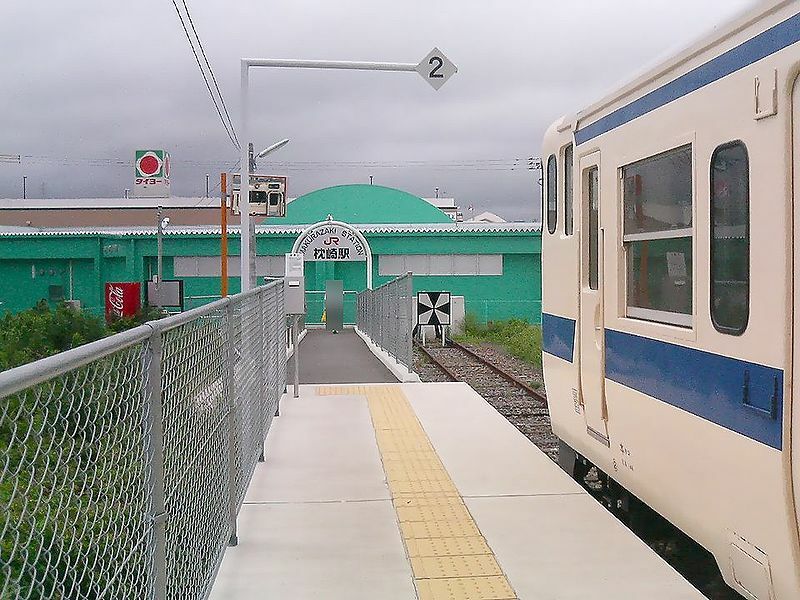 The Makurazaki Station, the terminal station on the Ibusuki-Makurazaki Line of JR Kyushu, the southernmost railroad line operated by the JR Group in Japan (Photo by Muyo). Six trains arrive and depart every day. The woman in the video is a volunteer who greets tourists on weekends. 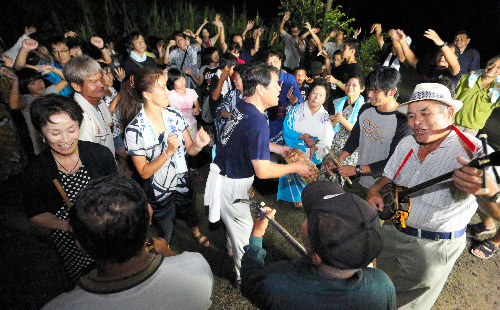 A performance of the arasetsu tradtional dance on the island of Amami, originally for the rice “spirit”. The island of Amami is part of Kagoshima, but that whistling is Okinawan. 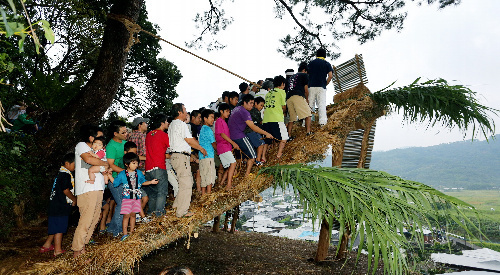 The Kawachi tug-of-war at Satsumasendai, Kagoshima, earlier this fall. It is almost as if tug-of-war were elevated to an extreme sport, and they’ve been doing it for 400 years. Try this previous report to find out how and why. The Shochogama ritual conducted on Amami Island in Kagoshima every September in supplication for a good harvest the following year. Designated as an intangible national cultural treasure, the event dates from the 16th century, when Amami was part of the Ryukyu Kingdom. The morning hula dances held on the second and fourth Sundays of the month on the beach at Ibusuki, Kagoshima, since April. Anyone can join. THE first major election has been held in Japan since the resumption of operations at the Oi nuclear power plant in Fukui and the fallout in the form of anti-nuclear power demonstrations. The news media just loves demonstrations (unless they’re run by the Tea Party), but they won’t like the results of this election. Mukohara, who serves as director-general of a local antinuclear body, opposed the restart of the Sendai plant and portrayed the election as a prefectural referendum on nuclear power. The incumbent Mr. Ito tried to downplay the issue, but said he favored restarting the Sendai plant. He added, in a classic kick of the can down the road, that nuclear power should be abandoned at some time in the future. Voter turnout was 43.85 percent, compared with 38.99 percent in the previous election. So, with voter interest higher than usual in an election the challenger wanted to make a referendum on an emotional issue, what was the margin of victory? That’s more slightly more than 66% for the man who favored restarting the nuclear power plant. But as Mukohara announced his candidacy just one month before the official start of campaigning, he struggled to gain voter recognition in many areas other than the prefectural capital of Kagoshima. Guess they don’t have newspapers, TV, or the wireless out in the Kagoshima sticks yet, huh? While looking for an English-language article to cite, I ran across someone else who explained it away by writing that the less-populated areas of the prefecture were “majorly dependent” (sic) on the employment provided by the nuclear power plant. So, one source has the people outside the big city unfamiliar with the candidate, and another has the people outside the big city very familiar with the issue as something that affects their livelihood. Putting aside the excuses and the flood of pixels sure to come in subsequent elections and demonstrations, what happened with the issue of nuclear power in Fukui and now Kagoshima provides an indication of what will likely continue to happen in the rest of the country. The expression kareki ni hana (枯れ木に花) literally means a flower on a dead tree, but the Japanese use it to refer to something that had waned but is now flourishing again. Whenever they want to come up with something fresh for the traditional Shinto festivals — the best free entertainment in the world — all they have to do is look into their past to see what they’ve already done. Here are three recent examples. 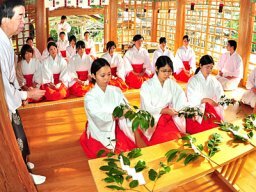 For years, the Kagoshimanians in Kimotsuki-cho performed the kagibiki as part of the Ohaku Shinto shrine spring festival in supplication for a good harvest, good health, and safety. There are two parts to the event — the first is a stick dance, which is shown here. 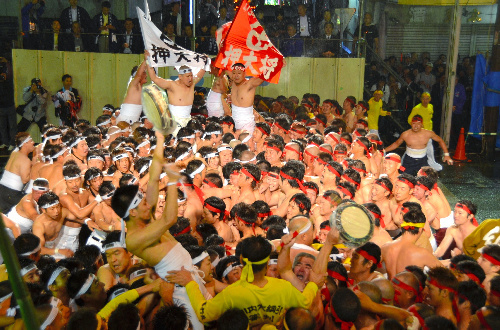 That’s followed by the kagibiki itself, which is a tug-of-war with a 1.4-meter-long pole instead of a rope. In events of this sort, the teams are usually separated by geographical region, and one team’s victory is an indication that the divinities will bless them with a good crop. In this town, the east and west face off against each other. Performances of the event stopped five years ago because there were too few children in the small agricultural community to conduct the dance properly. 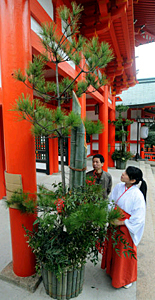 This year, however, some nearby small towns sent over some kids to help out, and 18 people in the local preservation society cut out sticks from the trees behind the shrine to provide all the equipment they needed. Here’s what the big fun looked like in another town where they used what looks like a real tree. 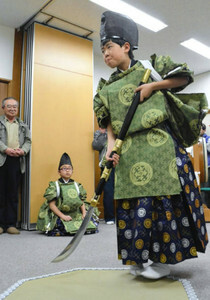 It’s been a lot longer since the Takayamanians in Gifu have performed the children’s kagura (i.e. Shinto dance) during the Hie Shinto shrine spring festival. In fact, it’s been 60 years. In its infinite wisdom, the GHQ during the postwar occupation forbid the performance of the sword dance, one part of the kagura, because swords are not healthy for children or other living things. The other part of this kagura is the halberd dance, and that ended when the guy who taught it died in 1955. 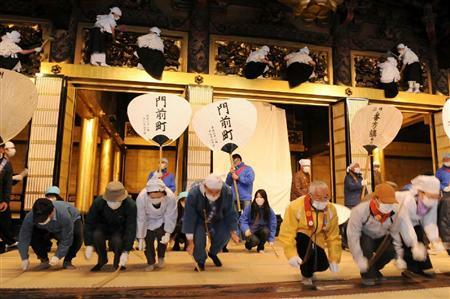 The preservation committee dug into the records, interviewed the people who saw the last performances, and took notes at four other similar shrine dances in the city. The dance involves walking around an octagonal shape created by tatami, and the object is to purify the area in every direction. They made the costumes, the swords, and the halberds, and trained four fifth-grade boys to perform the dance (two for each one). 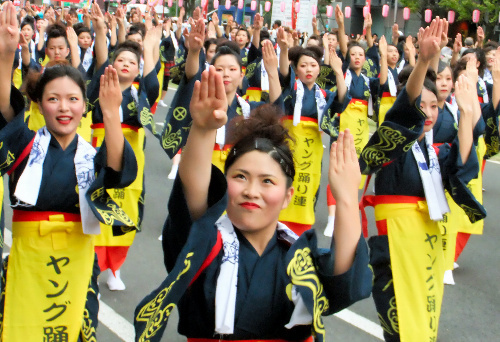 Finally, they’ll be bringing back the mawari odori, or the turning dance, in Yoshinogawa, Tokushima, in August. You’d think they wouldn’t have willingly let the city’s intangible cultural treasure die out, especially because it’s at least 500 years old, but depopulation was the problem. This is the second comeback for the dance, different forms of which are considered one of the three major types of popular festival dances in Japan. It ended the first time in 2003, was restored in 2007 and 2008, and then ended again after a municipal merger and the organizations for maintaining it had not been created. A city NPO formed an executive committee to keep it going this time, and the committee will transform itself into a preservation committee after August. Their intention is to promote its spread to other small settlements in the area. The mawari odori is actually a combination of song and dance that is an offering to ancestors, but it’s also a form of summer entertainment. The song is in the form of a male-female dialogue during the mid-August bon festival, and believe it or not, the now-sedate bon odori was once an excuse for the young men and women of isolated farming communities to have a little adult fun. An invitation to dance was a de facto invitation to head to the nearest clump of dark bushes as soon as possible to continue with the eternal dance. Bon odori was so bawdy it was actually banned on a couple of occasions during the Edo period. Here’s a different version of the dance in Kuroishi, Aomori. JUST because the warts of the overseas media and the commentator-bloggers who rely on them think their folderol is insight doesn’t mean you have to fall for it. The national decline of Japan, if it exists at all, is greatly exaggerated. Here are a few short snorts testifying to the national vitality. The first is a translation of a brief article, while the rest are summaries. Her ambition to become an aviatrix originated when she was a student at Ryukyu University (Okinawa). While flying on commercial airlines to her home in Sendai (the northeast part of the country), “I discovered I liked the scenery from the cabin window and wanted to see the view from the front.” She enrolled at a flight school in Miyazaki City after graduation. She chose to work at JAC because she enjoyed her many flights over Kyushu during training, and because she wanted to repay the many people in the industry in Kyushu for their help. A Japanese sentiment permeates every sentence of that article. For contrast, imagine how much self-importance it would have contained had the story originated in the Anglosphere instead of Kagoshima. 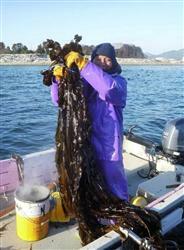 Last year’s Tohoku disaster was also a disaster for Sanriku wakame, a noted product of Miyagi. 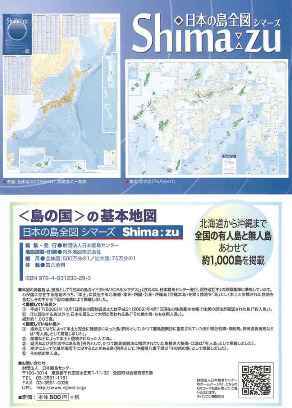 To help rebuild the industry, a Tokushima Prefecture maritime research institute in Naruto sent local fishing co-ops some wakame spores last October that the Miyagians raised in Kessennuma Bay. The first harvest was last week. It was a homecoming in a sense for the wakame because the folks in Miyagi shipped the Tokushima institute some of theirs in 2004 for cross breeding. The spawn from that mating is what Tokushima sent back. The spores grew to a length of two meters, though the water temperature this winter was lower than ideal. The quality, color, and thickness of the seaweed is good enough for it to appear on your dinner table soon. Local watermen harvested 400 kilograms on the first day. The harvests will continue until the beginning of April, when they expect to have hauled in a total of 3,400 tons. The big maritime product in Niigata is salmon. 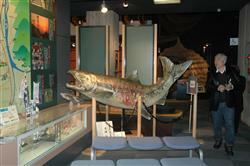 The Niigatans like it so much, in fact, they established the nation’s first salmon museum in Murakami called the Iyoboya Museum. Niigata was the Murakami domain during the Edo period, and it was there that salmon were first successfully bred in Japan. Since then, salmon has been an important part of local culture. Iyoboya is the name for the fish in the local dialect. Iyoboya fanciers say the best part of the museum is the mini-hatchery. Starting at the end of October, the museum recovers salmon eggs and fertilizes them. The eggs hatch two months later. Visitors get to see the fingerlings, and if they’re lucky, the hatching itself. The museum is now raising 50,000 fish, give or take a few, which it plans to release in the Miomote River at the beginning of next month. The museum also offers views of the river through glass windows. There’s a restaurant on the museum premises. Guess what’s on the menu! 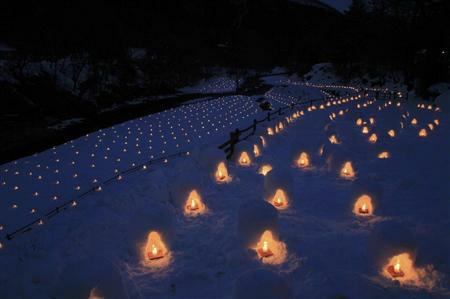 The Kamakura winter festival has been underway since 21 January at the Yunishikawa Spa in Nikko, Tochigi. The event is held in small snow huts in a gorge along the banks of the Yunishi River, which sounds like just the ticket for those who get off on nose-rubbing. This is a hot spring town, so visitors can enjoy both the hot and the cold of it, dipping in the spa waters for relaxation after all the fun with snowmen, snow slides, snow hut barbecues (reservations required) and musical performances. 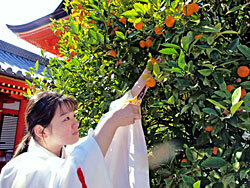 If you’re in no hurry for spring to start, the festival will last until 20 March. There’s a lot of snow in Hokkaido, too — probably more than in Nikko — but that didn’t stop Sapporo kiters from holding their 35th annual kite-flying contest in the city’s Fushiko Park. The winner this year was Tanaka Mitsuo, whose design featured a 100-meter-long chain of 100 linked kites. Mao Zedong once said, “Let a hundred flowers bloom”, but that’s got to be easier than getting 100 kites up in the air. 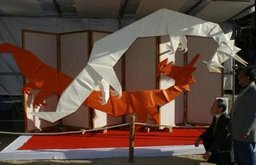 Each of the hundred was 60 x 42 centimeters, made of bamboo and washi (traditional Japanese paper), and designed to look like a dragon. 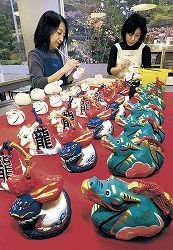 This is Dragon Year in the Chinese zodiac. 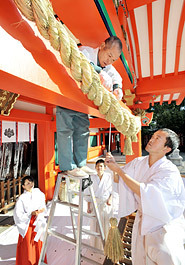 They’ve been repairing the Izumo Shinto shrine in Shimane lately, the first major renovations in more than 60 years. The local carpenters know just how to go about it, too — the Izumo shrine has been rebuilt 25 times, the last in the 18th century, and also moved several times. 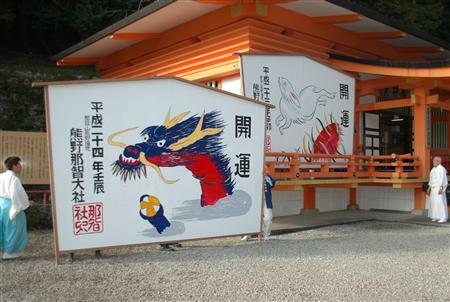 It’s the oldest shrine in the country, but ranks only number two in order of importance. (The enshrined deity is Okuninushi no Mikoto, the nephew of the Sun Goddess.) There’s still a fence around one part where mortals may not enter. The repairs are being made in conformity with the original construction techniques. That includes softening thin sheets of Japanese cypress by soaking them in water, and then using them to thatch the 600-square-meter roof with bamboo nails. Preparations began in 2008 and the work won’t be finished until next year, though the current phase ended in February. Had I finished this post when I intended, readers nearby might have been able to glimpse the main hall. Alas, I was sidetracked by other work and projects, and now the hall won’t be on view for another 60 years. Attendance also required a dress code: t-shirts, sweatsuits, or sandals will not do for a visit to the abode of Okuninushi, even though the divinity was moved to a temporary site on the premises in 2008 for the duration. 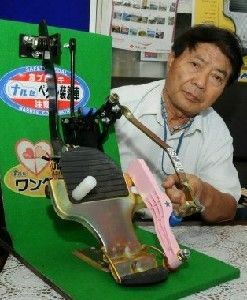 Naruse Masayuki of Tamana, Kumamoto, has presented a paper on the safety of his single pedal automobile system to the Society of Automotive Engineers in the United States. Mr. Naruse operates a company that makes industrial materials, one of which is One Pedal. That’s an all-in-one pedal for controlling the gas and the brake to prevent accidents caused when drivers step in it by stepping on the wrong one. There’s an attachment on the right side of the floor pedal for acceleration, which drivers hit with the right side of their foot to move forward. Stepping on the floor still brakes the car. The pedal’s been around for awhile — the old Transport Ministry conducted trials that demonstrated its safety. Mr. Naruse has custom-fitted nearly 200 cars in Japan with the device, but the major automakers don’t seem interested. Said Toyota, “Technicians have studied it, but we have no plans to adopt it now.” One complaint is that it’s more difficult to keep one’s foot against the gas pedal to maintain a constant speed than it is to downpress a pedal. Nevertheless, SAE plans to hold trials in Tamana with 70 drivers of all ages and foot sizes. Tomakomai in Hokkaido has the largest haul of the surf clam — that’s the spisula solidissima for you shellfish enthusiasts — in Japan. They’ve got to eat them all somehow, so they’ve begun promoting a clam rice burger made with what’s called a hokkii, which is also the city’s “image character“. (The name isn’t derived from the hockey puck shape.) 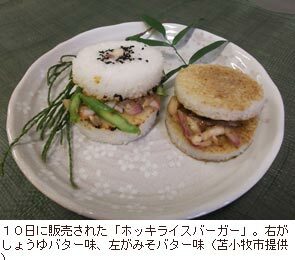 It was created by college students who liked the clam and made it for their school festival, and used rice for the bun instead of bread. City officials must have stopped by for a taste, because they adopted the idea and sold 1,600 at a three-day event last year. They then conducted trial tastings and questionnaires to get the perfect recipe, and shops around town began selling it in mid-December. There are several varieties with different condiments, but most sell for around JPY 400 yen, which is not a bad price. The idea is to get more people to come to Tomakomai. They’ve got as many goya in Kagoshima’s Minamiosumi-cho as they have surf clams in Tomakomai, so a local hot spring resort developed a way to incorporate them in senbei rice crackers. They slice and dice them and knead them into the batter. Reports say they give the crackers a slight bitter taste. That makes sense — the goya is also called the nigauri, which means bitter melon. Several groups in the city, including the hot spring resort and the municipal planning agency, created the snack as a way to use non-standard goya and gobo (yeah, that’s a vegetable) that can’t be sold on the market. They’re cooked by Yamato-ya, a Kagoshima City senbei company, and 40-gram bags are sold for JPY 315 yen. That’s a bit steep, but some of the proceeds go to local welfare services. Give them a call at 0994-24-5300 to see if they have any left. Instead of clams or goya, Shimanto in Kochi has a strawberry surplus. That was the inspiration for a sake brewer in the city to combine the berries with their sake and create a liqueur with two varieties, one dry and one sweet. The employees even filled the 500-milliliter bottles by hand, and you’ve got to wonder if they had the temptation to sample some. There were 1,000 bottles of the sweet stuff and 2,000 of the dry type going for JPY 1,600 apiece. The idea is to sell it to “people who normally don’t drink sake”, which is code for young women. They’re even selling it outside of the prefecture, so if the idea of strawberry sake appeals to you, input 0880-34-4131 into your hand-held terminal and ask for some. The more serious drinkers in Aira, Kagoshima, don’t fool around with fruity beverages, and demonstrated it by starting shochu study sessions last month. Some stalls specializing in that particular grog have been set up near the Kagoshima Chuo station, and the people who will operate the stalls attended three training sessions. One of them included lessons in the local dialect for dealing with customers. (Kagoshima-ben requires listeners to pay close attention, and even then you’re not going to get all of it, sober or sloshed. That includes their Kyushu neighbors.) The scholars also examined the traditional process for distilling it, listened to lectures on the origins of satsumaimo (a sweet potato variety) and how it came to be used in the local shochu, and visited the Shirakane brewers. Now that’s dedication for being a liquor store clerk. There’ll be 50 of them working in 25 shops at the stall complex. If the last story didn’t convince you that Kagoshimanians are serious about shochu, this one will. They’ve just marketed a new brand called Uchudayori, or Space Bulletin, made with malted rice and yeast carried aboard the international space station Endeavor last May for 16 days. It was developed by researchers at Kagoshima University and the Kagoshima Prefecture Brewers Association. (The university has a special shochu and fermenting research institute for students, and I sniff a party school subtext.) 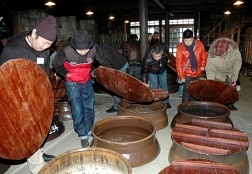 There are 12 different varieties because 12 companies used the base materials to distill their own well-known products, including those made with satsumaimo and brown sugar. Those interested in getting spaced out can buy a set of 12 900-milliliter bottles for JPY 24,000 yen, which is reasonable considering the transportation costs for some of the ingredients. Sameshima Yoshihiro, the head of the research institute, says it has a better aroma than normal. No, he didn’t say it was “out of this world”. Did that space travel bring back an alien life form? The shochu kingdom of Kagoshima is about to get its first locally brewed sake in 40 years. Hamada Shuzo of Ichikikushikino (try saying that after a couple of hits of shochu) announced they have started brewing the beverage. They’re the only sake brewery in the prefecture, and the first to go into the business since the last one shut down in 1970. That's where they make it, you know. 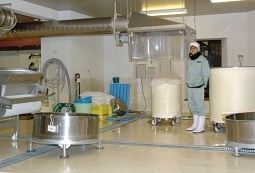 Hamada Shuzo remodeled their shochu plant last year by adding facilities for producing 60 kiloliters of sake annually. 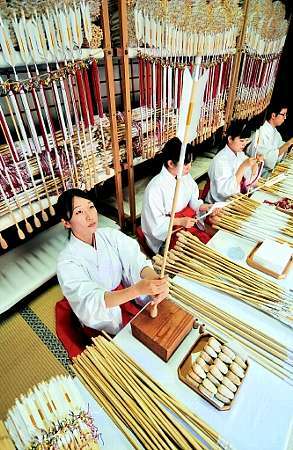 An affiliated company used to make sake in Aichi until 1998, so they’ll blow the dust off the old notebooks and apply those accumulated techniques and expertise. 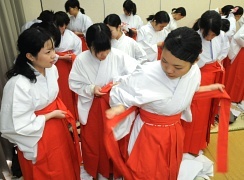 A Shinto ceremony was held to receive the blessing of the divinities before they began fermentation with 20 kilograms of rice from other parts of Kyushu. (Kagoshima rice doesn’t work so well.) The company hopes to cook up 800 liters by March. The company says Kagoshima’s higher temperatures — it’s Down South — make sake brewing difficult, and the shochu culture took root several hundred years ago. I have first-hand experience that Kagoshimanians drink shochu in situations where other Japanese drink sake, and it took about a week to recover. Statistics from the Tax Bureau support that anecdote. 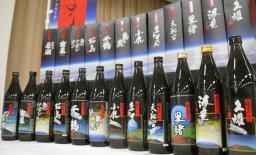 They say 36,767 kiloliters of shochu were consumed in the prefecture in 2010 compared to 1,379 for sake. 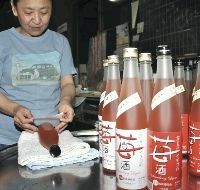 The company’s idea is to use sake brewing techniques for shochu product development. They might begin full scale production later, but the sake is now being brewed primarily for research. Didn’t I tell you these guys were serious? They’ve also got a restaurant/brewpub on the premises, and they hope it attracts customers who’ll also take a shine to their shochu. Sales in the restaurant begin in May, and in shops after that. Former sumo grand champion and now slimmed down stablemaster Takanohana announced he was starting a program to build sumo rings throughout the country to promote the appeal of sumo. The first will be in Shiiba-son, Miyazaki Prefecture. (Takanohana’s wife, the former newscaster Hanada Keiko, is a Miyazaki girl.) Mr. T believes that sumo helps build character, and he wants to see the rings restored at primary schools and other sites around the country. The Shiiba-son municipal government will contribute funds to the project and manage the ring once it’s built. The construction will be handled by the local Itsukushima Shinto shrine under the guidance of the Japan Sumo Association. Live as the cherry blossom, blooming vividly with full force and quickly falling from the branch. We cannot see the color, shape, or size of the spirit, but a person’s spirit manifests in his way of life, deeds, and words. There are three important things in the way of the rikishi and the way of sumo: form, greetings, and etiquette. That old time religion is still good enough for plenty of Japanese, and not just old guys who drink shochu and watch sumo. 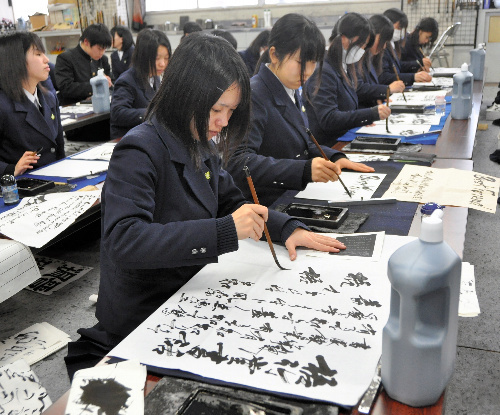 This month, a team from Saga Kita High School in Saga City was one of two selected for the grand prize in an annual calligraphic arts competition in Nagano conducted for high schools nationwide. It was the 17th year the sponsoring organization held the event, and the 17th straight year Kita High School won the grand prize. Kita students also won 11 of the 65 awards in the individual division. Teams from 273 schools participated and submitted 15,420 works. THEY’RE not foolin’ when they call it the Japanese archipelago — the textbook boilerplate is that the country consists of four main islands, though it’s becoming more politically correct these days to include the main island of Okinawa as the fifth. But few people, even among the Japanese, are aware the other roughly 1.000 islands, both inhabited and uninhabited, give the country an Exclusive Economic Zone of about 4.46 million square kilometers. That’s the sixth-largest EEZ in the world. Of the inhabited islands, the westernmost is Yonaguni and the southernmost is Hateruma, way down south near Taiwan, both part of the Yaeyama Islands (English-language website on right sidebar). Of those on which only seagulls reside, Okinotorishima represents the extreme southern edge of Japan, and Minamitorishima the farthest point east. Some of the better known among the rest are Tsushima in the Korean Strait, which some excitable Koreans like to pretend is theirs; Tanegashima in Kagoshima, the site of the first recorded contact between Europeans and Japanese in 1547 and the Japan Aerospace Exploration Agency’s Tanegashima Space Center; and Sado in Niigata, the sixth-largest island in the country and the authorities’ choice from roughly 700 to 1700 as just the place to send the dissidents and disgraced into exile. In fact, Charles Jenkins, the U.S. Army deserter and husband of North Korean abductee Soga Hitomi, could be considered a voluntary exile there now, though it is his wife’s home town. That’s not to mention the Senkakus, on which the Chinese and Taiwanese have designs; Takeshima, which the South Koreans occupy; and the four islands off Hokkaido referred to as the Northern Territories, which the Soviets seized after Japan surrendered in 1945. Japan Hands will not be surprised to learn there is a National Institute for Japanese Islands devoted to promoting interest in and the interests of the one thousand. Earlier this month, they published a map that squeezes every last one of them on one side of an 80 x 110-centimeter sheet. That required a scale of 5 million to one to accomplish. The other side features larger maps of regional island groups on a scale of 750,000 to one. The map also includes a list of their names and all the air routes to make it handy for visits. At JPY 525 plus about JPY 180 for domestic postage, that’s cheap even at twice the price for a fanatic such as me. We hope that people look at the map and get a real sense of Japan as a country made up of many islands. If you live in Japan and are interested getting a real sense of the island nation Japan, here’s the institute’s Japanese-language website where you can order one for yourself. Scout around on the site and you’ll also find a page that sells food and liquor from the islands, too. And if you don’t have the time or the money for a trip, here’s the next best thing — a YouTube tour of Yonaguni with a local folk song as accompaniment. 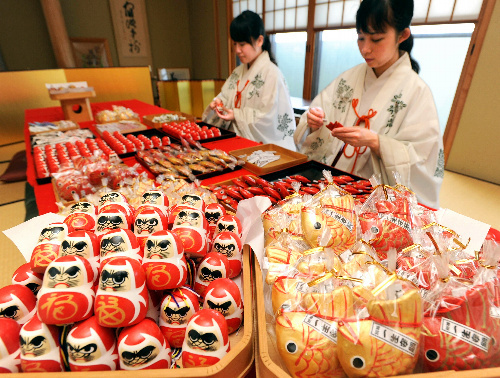 A PROMINENT feature of many Japanese festivals is a procession with elaborate floats or mikoshi. They are often larger than a single-family dwelling, centuries old, and crafted with exquisite workmanship and materials. These relics are literally priceless. But that’s not true of all festivals. 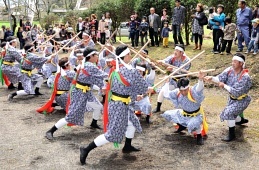 One example is the Uodon Matsuri held by the Hakosaki Hachiman shrine last month in Yusui-cho, Kagoshima. 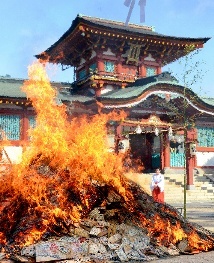 The festival, which is at least 500 years old, is an annual event to purge the local district once known as Yoshimatsu-cho of sin and impurities. 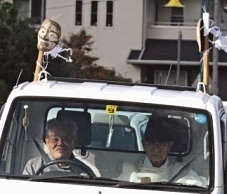 This is accomplished by tying carved wooden masks of a male and female divinity to the end of stakes and then parading them around the district while the shrine priest chants, “Uo, uo” to announce their presence. 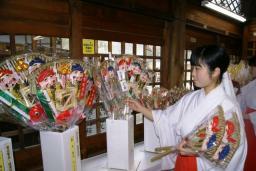 After the divinities have passed through every neighborhood, the masks are attached to bamboo stakes six meters high. These are placed on either side of National Highway #268 at the border with Miyazaki Prefecture and connected with a shimenawa, or sacred rope. There’s no better way to ensure that all the outsiders coming into the district will be purified too. No sticklers for needless tradition, the priests at the shrine have availed themselves of technological advances over the centuries to make their job easier. Originally, the masks of the divinities were carried on horseback. The priests later switched from horses to bicycles. But why get sweaty and out of breath with all that pedaling when you can make it even easier on yourself? Nowadays, they lash the stakes to the bed of a small pickup truck and chauffer the deities around, as you can see from the photo. Let’s not forget another advantage to the trucks: I don’t think the highway patrol will pull that driver over, do you? 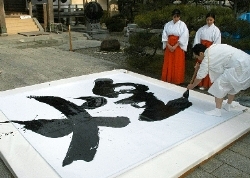 Incidentally “Uo” seems to be Kagoshimanian for the names of the divinities, and is written 大王. That’s usually pronounced daio and means great king. I couldn’t find an explanation for the name, or indeed any information beyond the content of the post. I suspect the “don” is also from the regional dialect. If I’m not mistaken, it’s derived from 共 (tomo), and is used to create plurals, such as in kodomo for children. Here’s an explanation in Japanese, but feel free to correct me if I’ve misinterpreted it. After six days on the road, anyone would need purifying, not just the truckers. 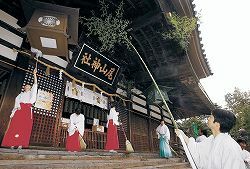 MORE than 800 years ago, in 1196, the Buddhist priest Hozan Kengyo was sent from the Myo-on-ji Jorakuin temple in what is now Shiga to attend the opening of a new temple in today’s Hioki, Kagoshima. Hozan was proficient in the biwa, and he taught 12 pieces of religious music to the local priests. 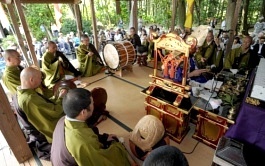 It was performed with eight instruments, including the biwa, flute, taiko drum, and shell horns. The name of the new temple was the Nakashima Jorakuin, and the music Hozan brought with him was known as Myo-on Junigaku (myo-on means exquisite music). The Japanese biwa is derived from the lute by way of the Chinese pipa, but several different types have been developed in Japan since then. This temple is said to be the origin of the Satsuma biwa, which was used not only for performing music, but also for the mental and moral training of the local samurai. In the past, only blind priests could serve at this temple, and many of the chief priests were renowned for their musical talent. Nakashima Jorakuin is affiliated with the Tendai sect, at one time the mainstream Buddhist sect in Japan and at its zenith when the temple was founded. Tendai was once associated with the Imperial court, and the Jodo and Nichiren sects are derived from it. A class of warrior-monks emerged from the sect after the 12th century, which applied pressure to the Imperial court and took sides in military and political disputes to defend what it considered to be temple interests. That ended when the warlord Oda Nobunaga almost completely destroyed their headquarters in 1571. The main temple of Nakashima Jorakuin was moved to a location near the Kagoshima Castle in 1619. With the early Meiji-period anti-Buddhist movement to disestablish Buddhism and replace it with Shinto, and the damage suffered during American bombing missions in World War II, the temple was again moved, this time to Miyazaki. 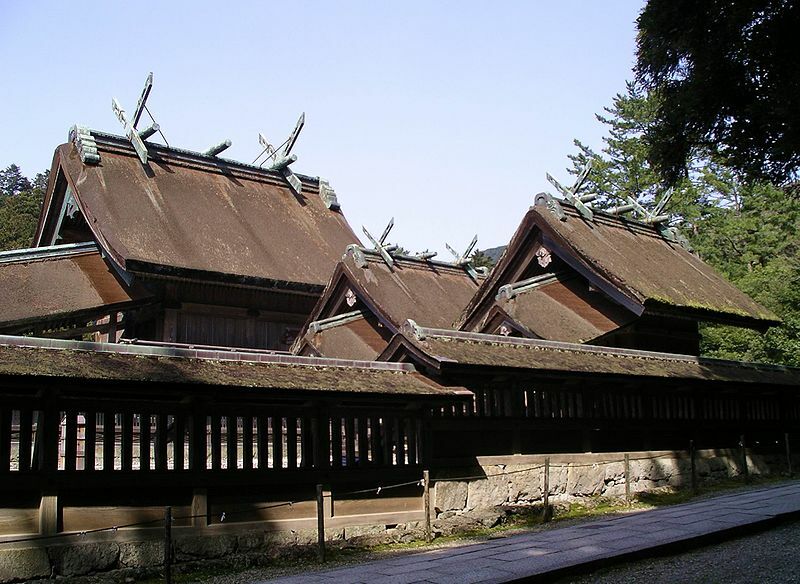 What remains on the original site in Hioki was the subsidiary temple, which has been reduced to one building and the graves of the chief priests. Kagoshima has designated it a prefectural historical site. Kagoshima also designated the 12 pieces of myo-on junigaku music as an intangible cultural treasure of the prefecture in 1971. 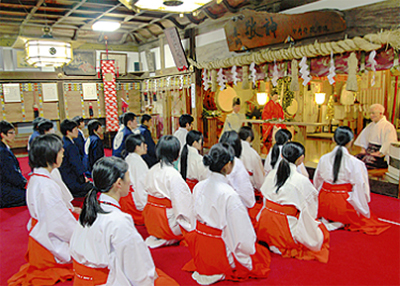 The repertoire was once performed by blind priests throughout southern Kyushu, but it is now heard only once a year and only at Nakashima Jorakuin, accompanied by readings of sutras unique to the temple. Here’s a two-minute YouTube clip from last year’s performance of music that has changed little, if at all, from a millennium ago.